Loss and loss and loss. I’m ready for a respite. But here’s something beautiful. When my grandmother passed away in December, my husband’s work sent him a houseplant to assuage his grief. The Grief Plant, as we called it, quickly became mine. And I have to admit that I felt no small amount of terror, because I have a black thumb. Killing the Grief Plant that was sent to commemorate the death of my grandmother might have been a little too much for me. But I cared for her and watered her and pretty much prayed that she would live and grow. A dearly loved family member died in a sudden accident a few days ago. We had never been exceptionally close because I rarely saw her, but after my little girls passed away, she took me in her arms and cried with me. She had lost children, too. She told me that I could talk to her about it any time, that she’d always be there and would understand long after everybody else would think I should “be over it”. I loved her fiercely since that moment! Now I’m packing to attend her funeral, which will take place during the family reunion. But something beautiful happened. My Grief Plant, which almost died while I was in New Orleans and everybody in the house forgot to water it, made a strong recovery. And look at this. Something small and white and perfect. I have no idea what kind of plant it is, honestly. But it’s giving me a gift. I’m so grateful. 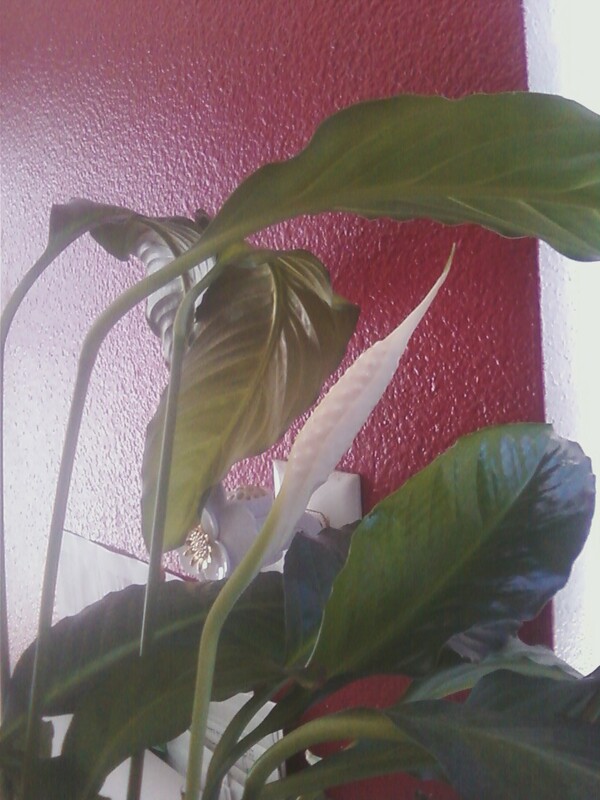 UPDATE: My friend Nycole told me it’s a Peace Lily. Hooray! It’s a peace lily. <3 Sorry for your loss.